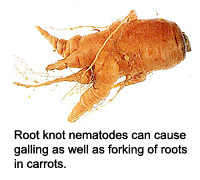 The nematodes that are parasites on plants can do a lot of damage to almost any part of the plant. The root knot nematod lives in the roots and causes knot-like swellings on the root system. In addition to carrots, they can infect many other plants. Sterilization: After removing dead plant material and turning the soil over, cover it with clear plastic, weighing the sides down with bricks. Four to six weeks of this solar treatment should sterilize the soil of most of the nematodes, but also of the good fungi and bacteria too. Using marigolds as a cover crop: After the sterilization, we will plow under our marigolds in the area concerned. The chemicals released into the soil by the marigolds cannot be tolerated by the nematodes. Then mulching should help introduce new good organisms to the soil. Info abt. nematodes from Deardorff, D & Wadsworth K. What’s Wrong With My Plant? (And How Do I Fix It?) A Visual Guide to Easy Diagnosis and Organic Remedies. Portland:Timber Press,2009. This entry was posted on Sunday, September 26th, 2010 at 5:19 pm	and is filed under Uncategorized. You can follow any responses to this entry through the RSS 2.0 feed. You can skip to the end and leave a response. Pinging is currently not allowed. Paul Stamitz in Washington State has done a lot of good work with beneficial fungi and bacteria. His company, Fungi Perfecti, sells packets of good organisms which you could use to re-introduce the good guys back into your soil [endo- and ecto-mycorrhizal fungi plus bacteria including Trichoderma harzianum (which produces antibiotics against late blight in tomatoes)]. Go to http://fungi.com/mycogrow/index.html and scroll down to “MycoGrow Soluble — I’ve been using this for a few years and one ounce for $5.95 is enough for your whole plot.